WASHINGTON, Dec. 15, 2017 /PRNewswire/ -- Two leaders in supersonic technology, Aerion and Lockheed Martin (NYSE: LMT) announced a Memorandum of Understanding (MOU) today to define a formal and gated process to explore the feasibility of a joint development of the world's first supersonic business jet, the Aerion AS2. Over the next 12 months, the companies will work together to develop a framework on all phases of the program, including engineering, certification and production. AS2 design advances with new engine configuration. Aerion has refined the aircraft design. Previously, three engines were grouped in the rear. The refined configuration still incorporates 3 engines, however the two outboard engines are now pulled forward, under the wing, while the 3rd remains in the tail. This configuration with 18,000-pound thrust turbofan engines, improves weight, balance, systems layout, maintainability, and simplifies some certification requirements. 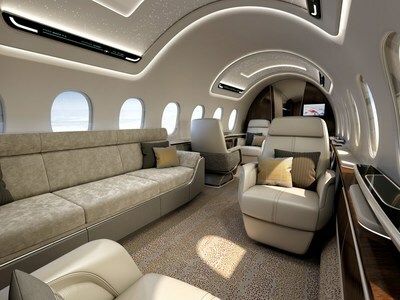 AS2 interior carries 12 in large-business-jet comfort up to 5,400 nautical miles (6,215 statute miles/10,000 km). Max. cruise speed is Mach 1.4, about 55 percent faster than today’s fastest commercial jets, at a speed greater than 1,000 mph/1,600 kph. The AS2 saves as much as three hours across the Atlantic and more than five hours across the Pacific. Aerion is working with Lockheed Martin and GE Aviation to develop the AS2. Aerion Chairman Robert M. Bass stated, "This relationship is absolutely key to creating a supersonic renaissance. When it comes to supersonic know-how, Lockheed Martin's capabilities are well known, and, in fact, legendary. We share with Lockheed Martin a commitment to the long-term development of efficient civil supersonic aircraft." 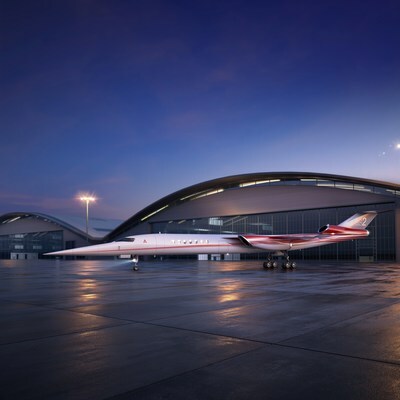 "We are excited to work with Aerion on their development of the next-generation, efficient supersonic jet that will potentially serve as a platform for pioneering future supersonic aircraft," said Orlando Carvalho, Executive Vice President, Lockheed Martin Aeronautics. The MOU is the result of extensive discussions between Aerion and Lockheed Martin's Skunk Works® Advanced Development Programs team. For close to 75 years, Skunk Works has existed to create revolutionary aircraft that push the boundaries of what is possible. Lockheed Martin, known for developing the world's leading supersonic combat aircraft, the F-16, the F-35, and F-22, as well as the Mach 3+ SR-71 reconnaissance aircraft, is committed to fostering new innovations and developing supersonic technologies with civil and commercial applications. "Following our initial review of Aerion's aerodynamic technology, our conclusion is that the Aerion AS2 concept warrants the further investment of our time and resources," said Carvalho. "We are committed to remaining on the cutting edge of aerospace technology and are excited to examine the contribution we might make to working with Aerion on making aviation history." "We are grateful for Airbus' contribution to the program," said Brian Barents, Aerion Executive Chairman. "We could not have moved the program to this stage without their support." Aerion Corporation of Reno, Nevada, was formed in 2003 to introduce a new era of practical and efficient supersonic flight. Over more than a decade, Aerion has developed and demonstrated advanced wing technology in conjunction with NASA and other leading aeronautical institutions. This research includes breakthrough work in supersonic natural laminar flow, the key enabling technology behind the AS2 business jet. The 12-passenger AS2 is expected to fly at a maximum speed of Mach 1.4 over water, and, where permitted by regulation, at speeds approaching Mach 1.2 without a sonic boom reaching the ground. Thanks to its unique supersonic natural laminar flow wing, the aircraft is expected to achieve long range (LA to Paris) and efficiency at supersonic and subsonic speeds. Once fielded, it will reduce trans-Atlantic trips by as much as three hours, enabling business leaders to fly roundtrip between New York and London in a day. In November 2015, Aerion announced a fleet order from fractional aircraft fleet operator Flexjet for 20 AS2 aircraft. Aerion expects the AS2's first flight in 2023 and certification in 2025. Headquartered in Bethesda, Maryland, Lockheed Martin is a global security and aerospace company that employs approximately 97,000 people worldwide and is principally engaged in the research, design, development, manufacture, integration, and sustainment of advanced technology systems, products, and services. More information can be found at www.aerionsupersonic.com. Statements in this release about future actions and the consequences of these actions or not otherwise statements of historical fact are "forward-looking statements" and, to the extent attributable to Lockheed Martin, are based on Lockheed Martin's current expectations and assumptions. Forward-looking statements in this release include, but are not limited to, the potential that Lockheed Martin will enter into a binding commitment with Aerion, the nature and scope of any such commitment, Aerion's technology and the prospects of the AS2 program. Forward-looking statements are subject to risks, uncertainties and other factors that could cause actual results to differ materially from future results expressed or implied by the forward-looking statements.